My travels in the world of dolly diversity have resulted in the saving of endless bookmarks. To try and reduce the list this post is a round up of all the dolls I've come across representing people with Down's syndrome. Down's is a genetic disorder caused by an extra chromosome (or part thereof). It occurs in about 1 in every 1,000 births. Distinctive characteristics include slanted eyes, poor muscle tone, a flat nasal bridge, a single crease in the palm (making the life of the palm reader somewhat more complicated...), a large gap between the first and second toes, and a large tongue (which, combined with a narrow roof of the mouth, is the reason why the tongue may protrude). The traits will obviously differ in degree from person to person, but these are the most common visual cues. For more information, check out the Down's Syndrome Association, DSRF, or DSE International. My cousin has Down's so I've always been interested in the representations out there. 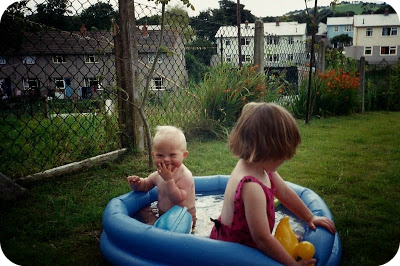 Here we are as babies. I don't know what's going on with my wall of hair - I blame my mother. 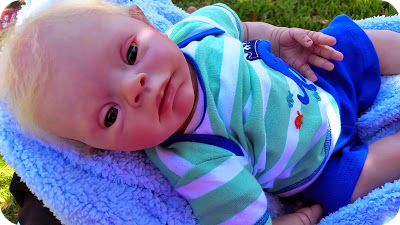 Ashton Drake - A Special Joy: This cute baby doll is from Ashton Drake's So Truly Real line, meaning it's weighted and poseable to be as lifelike as possible. Priced at $129.99 (c. £86) it's available HERE. You can also read a review of her HERE. Baby Down: Play line baby dolls (you could get a boy or a girl) produced by Spanish toy company Super Juguete. 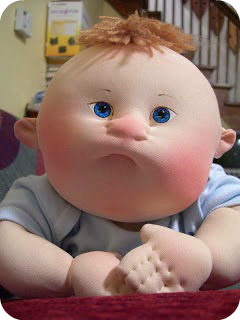 These are the most mainstream of all the dolls on the list - they were sold in regular toy shops in Spain and Italy between c. 2007 and 2009 and retailed for €34,90 (c. £26) each. Read more HERE and HERE. 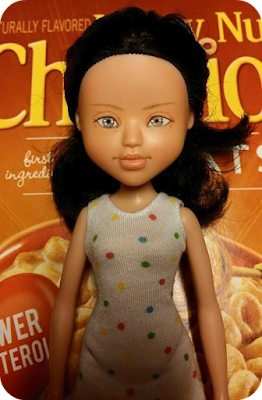 Boxel: Bets and Amy Boxel create amazing artist dolls in small editions. Anne Sophie above was produced in a limited edition of 5 in 2009. Read more HERE. This is the only pic I've been able to find, from Camp Venture's history page. Camp Venture: Made two soft dolls - Danny and Dolly Downs - in a choice of three skin tones. You can read more about them, and the information which accompanied them, HERE. Dolls for Downs: When I read the story behind the company, I'm not ashamed to say I cried a little. 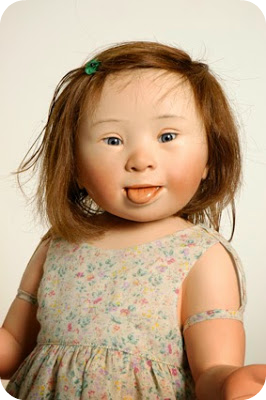 Connie Feda's nine year old, Hannah, was flicking through a magazine when she saw a doll that looked like her younger sister. But no matter where they looked she couldn't find a doll that looked like her. This set Connie on a mission. In her own words: "I want Hannah to see a doll with Down Syndrome and see something beautiful, because that's what I see when I look at her." 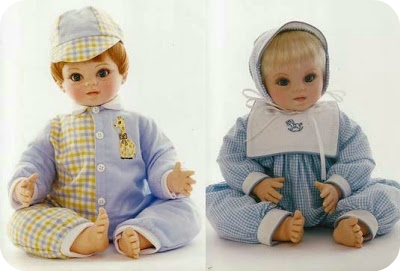 There are girl and boy dolls available with a range of skin, eye and hair colours, retailing for around $75 (c. £50) each. In addition to the distinctive facial features they have the 'sandal' toe gap, the single crease in the palm, the typical limb proportions, and the option to have a chest surgery scar (something like half of all babies born with Down's need heart surgery). The flagship doll is, of course, named Hannah. Check out the website HERE, or the facebook page HERE. Down Dolls: There are seven dolls in this line (pictured are Tomas, Mikael, and Tatjana) with soft bodies and vinyl limbs, retailing for $49.95 (c. £33) each. They are available in open (with protruding tongue) or closed mouth versions. Find out more about them at downsyndromedolls.com. 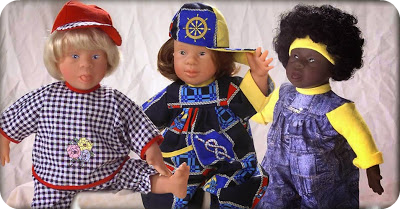 These were the dolls used in a fascinating piece of research into self esteem in children with Down's syndrome - read more HERE. Downi Creations: A not-for-profit venture which sadly now seems to be defunct. There were eight dolls in the line, all collector quality which retailed for around $175 (c. £116) each. Read more about them HERE. Maddy and Madeline: These OOAK (one of a kind) dolls were created by Veronica McRae of Cubby House Kids for the #ToyLikeMe challenge. They're inspired by the model, Madeline Stuart. The Pattycake Doll Company: There are four dolls available - two girls and two boys - retailing for $24.99 (c. £16.50) each. 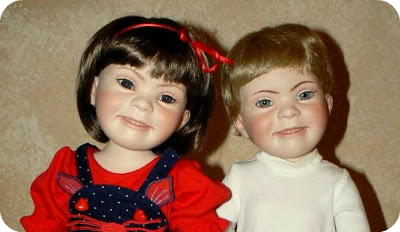 I've seen a lot of criticism of these dolls, namely that they're 'ugly' and 'scary'. As these are descriptors I feel can be applied to most rag dolls, I guess it comes down to that whole matter of subjectivity. 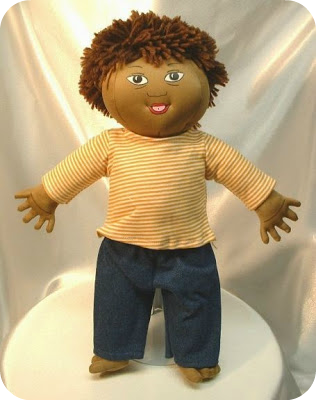 The Crafty Queen: Cabbage Patch style doll with Down's - read more HERE. 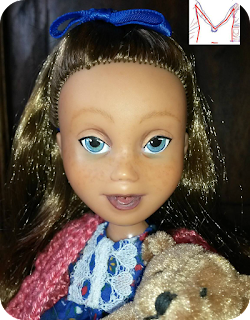 Roisin: This OOAK (one of a kind) doll was created by Melissa Marzee Muse Thomas as part of the #ToyLikeMe challenge. 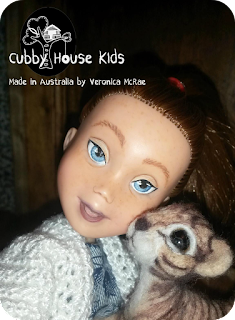 The doll is named for the inspirational Roisin De Burca - read more HERE. 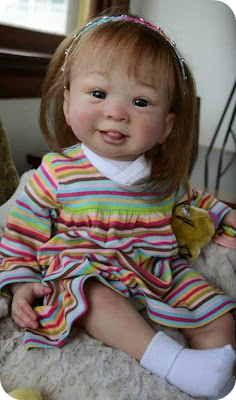 I agree, and ive made one, a reborn doll version, Hoping to find her a new mummy. 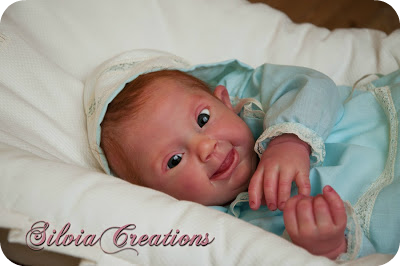 Just made a what i feel resembles a downs syndrome reborn doll,doll kit Paulette Lindsay by Linda Webb. Need to sell her, very sweet little tongue sticking out closed eyed version.